In the Middle East and North Africa, water is rapidly becoming the key development issue. In response, policymakers have proposed or tried to implement policies such as higher water tariffs or privatization, but have done so without considering local culture and values. Yet culture, including religion, clearly influences how people perceive and manage a resource such as water, and must be considered during policy development. This book presents Islamic perspectives on a number of proposed water-management policies, including water demand management, wastewater reuse, and fair pricing. The book opens avenues for a wider dialogue amongst researchers working at identifying the most promising water management policies, adds to our knowledge of some of the influences on formal policy and informal practice, and makes these ideas available to a broader public. It dispels common misconceptions about the Islamic view on water-management practices, such as selling water and wastewater reuse, and serves as a concrete example of the benefit of examining development in the context of values and culture. 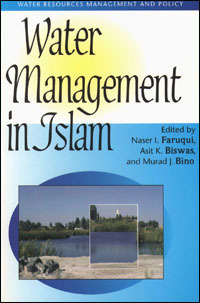 Water Management in Islam will interest researchers, scholars, and students in natural resource management, Islamic studies, Middle Eastern studies, development studies, and public policy. It will also be of interest to professionals, including policymakers, in donor organizations, development organizations, NGOs, and government departments and agencies, both North and South, working in the area of water management. Naser I. Faruqui is Senior Program Specialist at the International Development Research Centre in Ottawa, Canada. He was selected in 1999 by the International Water Resources Association as 1 of 14 water leaders of the next generation, worldwide. Asit K. Biswas is President of the Third World Institute for Water Management in Mexico. He is a member of the World Commission on Water and Past President of the International Water Resources Association. Murad J. Bino is Executive Director of the Inter-Islamic Network on Water Resources Development and Management in Amman, Jordan. Can we tackle climate change with social equity? Taking a leadership role in promoting socially transformative research to more effectively deal with climate change. View moreCan we tackle climate change with social equity? The opening reception of IDRC’s MENA Regional Office will be held on March 3, 2019 in Amman, Jordan. International Development Week, observed February 3-9 this year, is an opportunity to focus on Canada’s contributions to global development.